The Wars of the Successors led to the establishment of three Hellenistic Kingdoms: the Antigonids (Macedon), the Ptolemies (Egypt), and the Seleucids (from Asia Minor to India). The Seleucid Empire began to fragment, losing Judea and most of its eastern provinces and parts of Asia Minor. Antiochus III became ruler at the age of 18 in 223 BC, and immediately began restoring his empire. In 217 he retook Judea and marched on Egypt with 62,000 foot, 6,000 horse and 103 elephants. Ptolemy IV, with a much smaller army, enrolled native Egyptians into his Greek phalanx to bring his numbers up to 70,000 infantry, 6,000 cavalry and 73 elephants. The two armies met at Raphia on the Egyptian frontier. Both armies deployed with their phalanx in the center and cavalry on the wings. Antiochus began the battle by charging forward with his right wing cavalry and breaking Ptolemy's left. The young Antiochus impetuously pursued the fleeing cavalry before him. Meanwhile, the Egyptian right swung forward into action and defeated its counterpart. With both wings wheeling in opposite directions, Ptolemy ordered his center to attack. 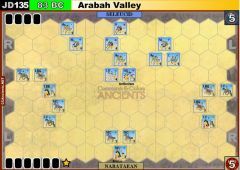 Surprisingly, the Egyptian phalanx got the best of the veteran Seleucids and Antiochus' entire army broke and fled. Antiochus withdrew and Ptolemy recovered Judea. Despite this defeat, Antiochus went on to re-conquer his lost provinces and restore the great Seleucid Empire. Ptolemy, on the other hand, soon faced a major rebellion led by the Egyptian soldiers he had trained for the phalanx. 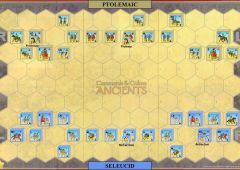 Ptolemaic Army: Use Greek (blue) and Roman (red) blocks. All icons shown are Greek icons. 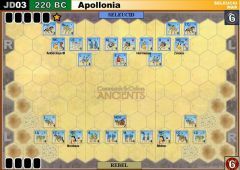 Seleucid Army: Use Eastern Kingdom (tan) and Carthaginian (brown) blocks. All icons shown are Eastern Kingdom icons. Looking forward to playing this Greek on Greek game using the new Spartan expansion! Just hope it will be available in UK before Christmas. Thank you Martin for pointing this out. I've fixed it right now. The War Council shown above is wrong and mixed with that for Cannae. Yesterday night I played my first Epic scenario ever. 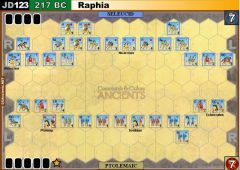 Reading forum all around we decided to give a try to RAPHIA (217 BC): it has been told to be one of the more balanced epic scenario. 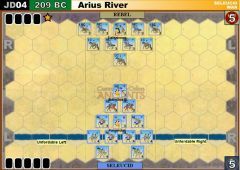 Seleucid amry started moving on both flank, trying to fire some arrows... with few luck. Ptolemaic fired back on both flanks with minor Ligh Units skirmish. After some minor order ... the APOCALYPSE. 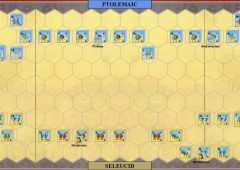 Ptolemy played a "Mounted Charge", allowing him to move 7 units (and rolling +1 attack dice). He advanced with his right Leader (Echecratus) supported by Heavy Cavalry and also with Elephants on both flanks. 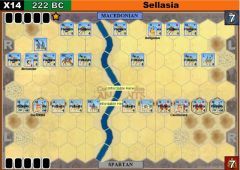 The result was an hard hit on Seleucid Army (partial result 7-2). In the meantime Heavy Infantries on both ceneter side advanced a little bit, without taking part to battles in the whole game. 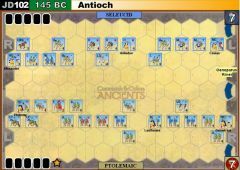 Antiochus managed to gain more control over his Right Flank, but on the other side Ptolemaic managed easily to gain full control over his Right Flank. Echecratus + HC definitely ruled this game, outflanking Light opponent units (avoiding thei retreat). 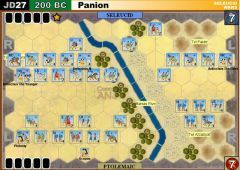 Dice were unbalanced, favouring Ptolemaic side... but that's FORTUNE OF WAR.